26 photos of BR's last operational Britannia Pacific on railtour duty in 1968, then in preservation at Bressingham where it was from 1968 until 2004, when it appeared at NRM's York Railfest. It then went to the Great Central Rly for overhaul before coming to Carnforth in 2008 to return to the main line for the first time in 40 years. 70013 Oliver Cromwell, Stockport Edgeley shed, 16 March 1968 1 On 17 March 1968, 70013 Oliver Cromwell and 4472 Flying Scotsman worked specials from Stockport to Carnforth. The two locos were put on display on the previous day at Edgeley shed, along with 5596 Bahamas. 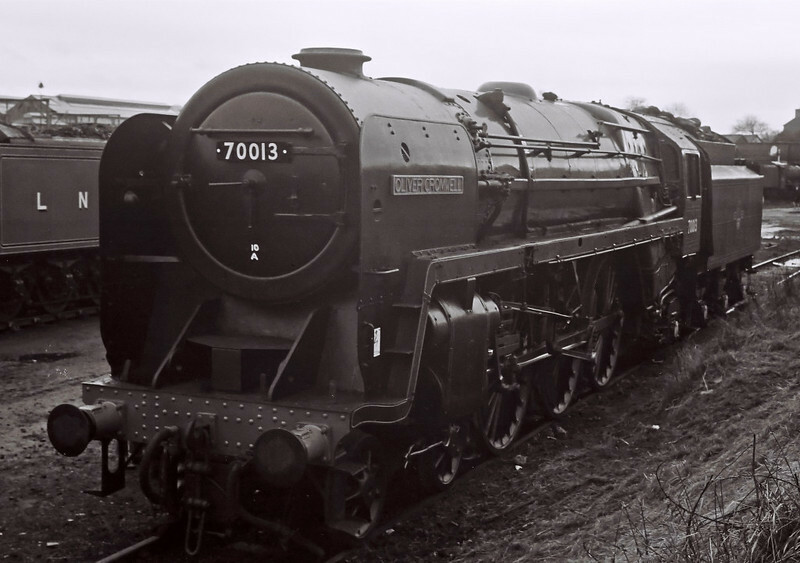 Here is 70013, with painted 10A (Carnforth) shedcode.